Champs-Elysées – Etoile, in the capital’s prestigious Golden Triangle. This magnificent apartment on the fourth floor of a late 19th century building. 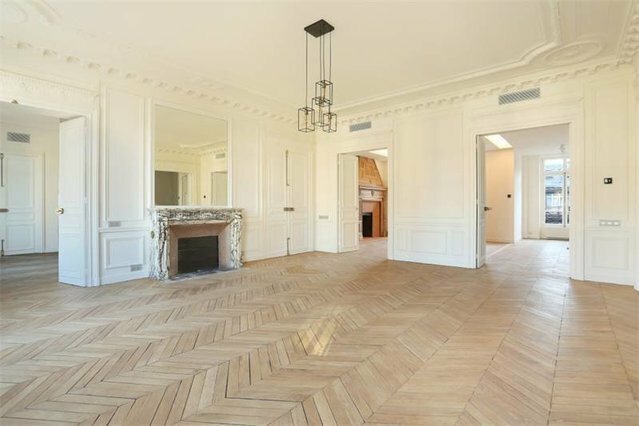 Featuring Herringbone parquet flooring, remarkable fireplaces, and high ceilings with exposed beams and mouldings, it offers 211 sqm of very bright living space including a living/reception room, a dining room, a kitchen, three bedrooms and three bathrooms. Renovation is required to exploit the full potential. The building has a caretaker and is equipped with a lift, a door-entry code and an intercom.